Architect Gregory K. Hunt, a leading authority on Charles Goodman, will lead a roundtable discussion this Saturday about Goodman’s River Park in Southwest. The free event (including breakfast refreshments) from 10 a.m. to 11 a.m. will be held in the River Park South Common Room located here. Hunt, the founding dean of the School of Architecture at Marywood University and the former dean of the Catholic University School of Architecture, has been a long-time resident of Goodman’s Hollin Hills in Virginia. From what I have read about Goodman, he was influenced by Mies van de Rohe and had many books in his library of the master’s work. 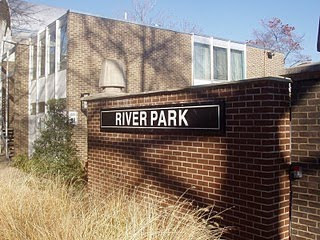 River Park’s apartment building and townhomes definitely evoke the urban renewal work of Mies in Lafayette Park in Detroit. With the problems Detroit is facing right now, you can pick up Mies-designed townhomes for $100K here and here. Does anyone know if this took place or if it has been rescheduled? If it did happen, I'd love to see/hear any comments about the lecture.